While the plants can prove tricky to get going as they resent transplanting, once established they will spread readily. The Californian tree poppy requires fertile, well-drained soil, and shelter from strong winds. It can be propagated from root cuttings taken in the winter-early spring months.You don’t have to be a fan of California natives to recognize the Californian tree poppy! Many instantly fall in love with its enormous “fried egg” flowers of pure-white petals the texture of crepe paper which appear for months on end in the summer. 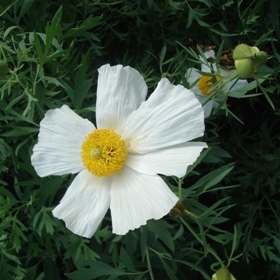 Together with its handsome, deeply lobed, grey-green leaves they make Romneya coulteri an excellent specimen plant for a sunny mixed border. Just be aware that this handsome plant is one of the tallest members of the poppy family as well as having the largest flower in the genus!